We have a new challenge at Freshly Made Sketches! This week our sketch has been designed by the wonderfully talented and clever card maker herself Linda Callahan. I fell in love with Linda’s awesome sketch as soon as I saw it. I knew exactly which stamp set and colours I was going to use on my card when I sat down to create. I wanted to bring the circles together by using flowers and leaves that spread over the middle and lower circles. The flowers I’ve used are from Love What You Do. I’ve given them a light watercolour with Rich Razzleberry Ink. The leaves are from Rooted in Nature and are stamped in Old Olive Ink with some added definition with my Early Espresso Marker. The sentiment on the main circle is from Love What You Do. I am loving the flow-y font in this sentiment. After stamping the sentiment and arranging the flowers around the stitched circle, I re-checked the sketch and realised it had a sentiment lower down….it really does pay to look at those things before you get excited and stick things on your card. 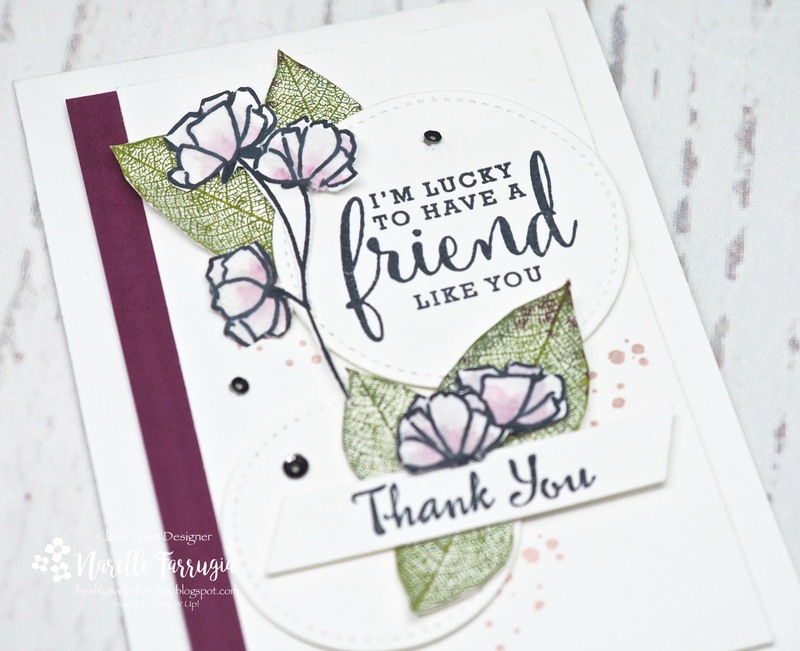 I found a thank you sentiment from Petal Palette that I think has a similar font and was pleased to see it doesn’t look out of place. I added some Powder Pink ink splatters from Timeless Textures and added some sequins to fill in spaces and to add bling. A card can never have too much bling! I always enjoy seeing the variety the Clean Team create with their cards. Head over to Freshly Made Sketches and see what they’ve created. I love how you have those sweet leaves tucked into your design! Beautifully done! What a gorgeous card Narelle! I love those flowers and leaves! Fussy cutting at its best! The splotches look fabulous in the background! So pretty as always! Haha! If I had a nickel (that’s 5 cents in US-speak) for every time I put a sentiment in the wrong place, I’d be rich! 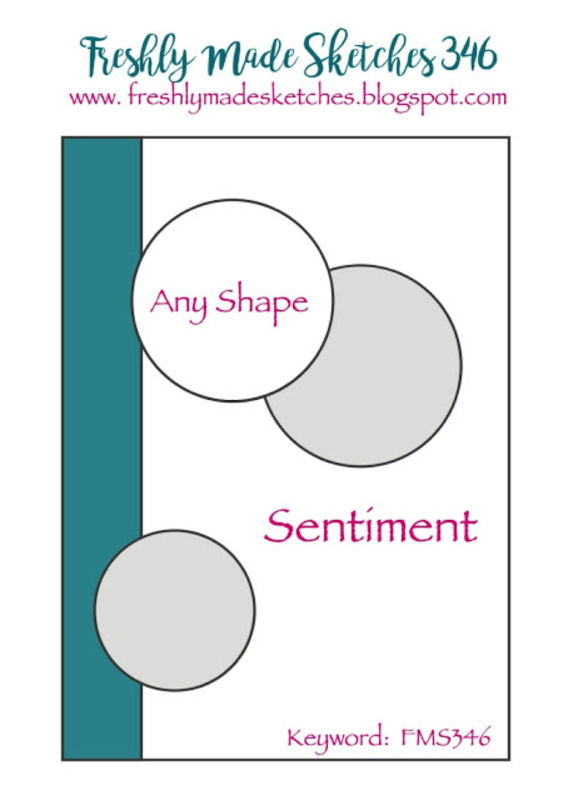 It’s fantastic that you added the extra sentiment and it fits perfectly with the theme of your card. And what a beauty this is! You’ve taken this sketch and made it yours with that amazing grouping of elements! It’s truly lovely! 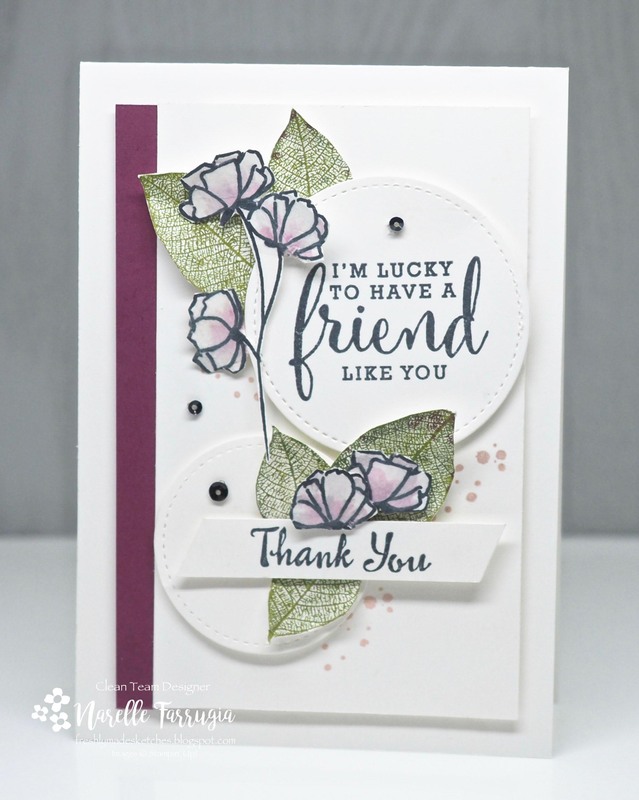 Beautiful card, gorgeous colours and wonderful layering! The detail on those leaves is stunning. As is your card, Narelle! I love the colors and your arrangement of all of the elements.